There is a space of 30-45 min in the morning between when Lilly wakes up and hits the ground running, and when I am cohervent enough to feel like going downstairs. Sometimes she gets books out and "reads" to herself but more often she just whines to go downstairs. This morning she noticed the box and acted like Santa had come when I said it was for her. 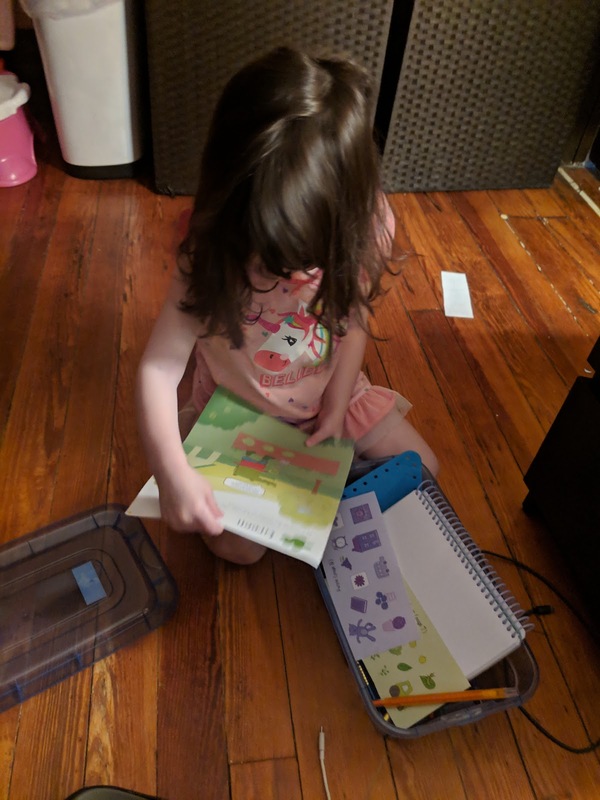 She opened the box and went through the treasures, which, you'll remember she already owned, and kept saying, "oh thank you, thank you so much! I love it!" So far she has done the lacing card and then used the lace as a fishing line while chatting with imaginary friends, and now she's checking out the notepad & pen. I think now I will be the one telling her it's time to go downstairs and she will be the one who isn't ready!